The current unpredictable geopolitical environment makes corporate planning more challenging than ever before. Simon Knowles, Chief Marketing Officer at Maine Pointe, argues that, along with the problems uncertainty creates, there is a significant opportunity for executives to improve productivity and increase competitiveness. 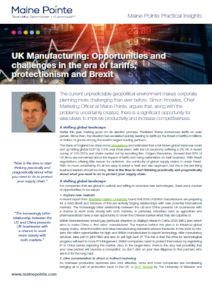 This practical insights paper for UK manufacturing CEOs and supply chain leaders discusses 4 practical and pragmatic ways to protect your global supply chain.